In addition to eclectic style cues, Spark offers the spunky performance to match. With an I-4 engine, you can experience pure driving exhilaration with an EPA-estimated 39 MPG highway. For punchy control, choose the 5-speed manual transmission. Or for a smooth ride, opt for the available Continuous Variable Transmission (CVT). 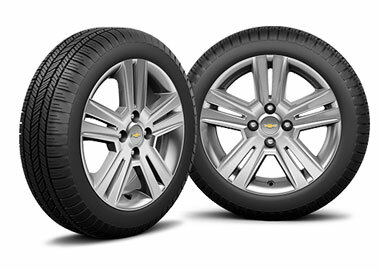 CVT seamlessly adjusts to driver throttle input and speed for a comfortable and effortless ride. For a mini car, Spark offers more than meets the eye. Five doors, including the rear hatch, give you multiple points of entry for your friends and larger loads such as bicycles, suitcases, groceries, instruments and more. 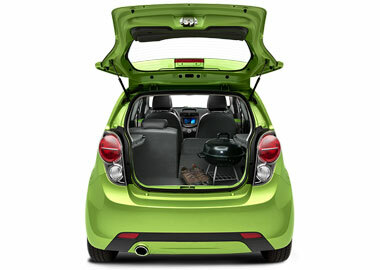 The distinctive design of the rear hatch showcases the sharp, sporty look of Spark. The city moves fast and so do you. Adeptly maneuver through traffic with ease. Slide into tight parking spots that other cars don’t dare dream of. With a cleverly compact size and confident handling, navigating the urban jungle is seemingly effortless. Whether you choose the standard 15" split 5-spoke silver-painted aluminum wheels or the 15" machined-face aluminum wheels (2LT only), you can match your ride to your style. When you turn heads, your style is undeniable and that all starts from within. Color-coordinate your interior and exterior in trim hues like Red with the Salsa exterior or Silver with the Silver Ice exterior. Let loose with comfort and style. Get sporty heated leatherette seats when you choose the 2LT model. And no matter which model you choose, you will enjoy the sporty look of the motorcycle-inspired instrument cluster. When it comes to the latest buzz, you’re always the first to know. Now, staying on top of things just got easier with available built-in OnStar® 4G LTE. The Wi-Fi® hotspot inside Spark is easy to use since it’s automatically turned on after initial setup. With the vehicle on or in the ACC, this allows you and your passengers to easily connect up to seven smart devices to the Internet. So you and your friends can easily look up your city’s best-kept secrets while getting a move on. Smart technology is about more than having the most gadgets. 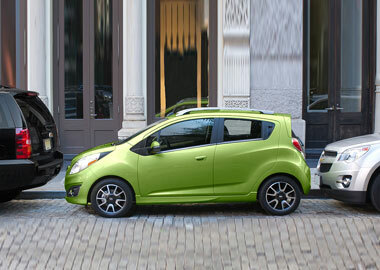 Streamline your life with Chevrolet MyLink, available on LT models. Think of the available 7-inch diagonal color touch-screen display as your personal command center for connectivity, entertainment and everything you need to get around the city efficiently. With the right gear, exploring the city is simple. Maps, contacts and vehicle info are all within reach when you use the available 7-inch diagonal color touch-screen to access Chevrolet MyLink or the OnStar® Directions & Connections® Plan (includes 6 months of service). Spark connects you to all of the latest technologies that take you from point A to point B – and even C – with available BringGo, the most affordable in-dash navigation system in its class. BringGo offers turn-by-turn directions, an Eco driving profile, 3-D maps featuring lane suggestions, and route information that includes alternate map views, estimated time of arrival, remaining distance and fuel cost. Don’t just drive. Be connected. When you drive a Spark you have integrated technology at your fingertips. Never drive alone again with Siri Eyes Free. Pair your iPhone with available Chevrolet MyLink Radio to seamlessly access Siri Eyes Free. Whether you’re a style maven on the hunt for local boutiques or a sports fanatic checking scores, Spark with Siri Eyes Free† has you covered. Use the available USB port or sync wirelessly using Bluetooth® wireless technology. However you choose to connect, enjoy all of your media and entertainment like Pandora® Internet Radio, Stitcher SmartRadio™, TuneIn and SiriusXM® Satellite Radio (3 month trial included). Spark provides a great combination of safety and technology with features like the StabiliTrak® Electronic Stability Control System with incorporated antilock brake system. By controlling vehicle slide and wheel spin, these features help keep you in command. Getting around your city just got a little safer. With the 2015 Spark, you get 10 standard air bags. That’s plenty of safety packed into one mini car.